DashThis is an excellent reporting platform that makes it easy to integrate with a big number of advertising platforms, including Google Analytics, Google Ads, Facebook/IG, Twitter, MailChimp and more. Any platform that doesn't have an API to plug into DashThis can easily be turned into a custom CVS data to add to reporting. I wish that with one reports, you could compare different time frames. Currently, to compare year over year, you have to have a separate report to also look at month over month. I find the customer service from DashThis is extremely helpful, professional and friendly. Our rep has even made personalized videos demonstrating exactly how to do things if I couldn't find the answers in the knowledge base. Easy overall platform, though mapping out CSV's for custom data can be a bit difficult. I use DashThis to have a reporting dashboard that updates regularly to share with clients. It has made reporting easier with built in API connections and importing CSV data. "Great Reporting Tool for Client Ad Campaigns"
Ease of use / Simplicity - We assessed various tools such as Klipfolio and Swydo and Dashthis was on a whole another level. Loading speed of reports - One issue where we went against going with Klipfolio was the speed to load dashboards and Dashthis completely eliminated this concern with their tool. All Facebook ad metrics are supported unlike other tools out there - Average video watch time, videos watched at 75%, etc. Support - The team is great! - No option to refresh the data in all widgets in a dashboard but it can be done on a widget by widget basis. If you need, a great reporting tool for clients or your internal team on a weekly or monthly basis, Dashthis is the one. Being able to have an overview of all key metrics in one place has allowed us to understand the big picture of our campaigns without spending too much time shifting through Facebook's Ad manager and Analytics. "Best performance reporting tool out there"
We've played around with COUNTLESS reporting tools over the years but none of them come anywhere close to Dashthis. The number of data sources you can integrate as well as the level of customisation of the reports are incredible. The tool itself is also really easy to work with, with minimal learning curve. It is also well suited for agencies who work on a large number of clients. And let's not forget their unrivalled client support! Well done Dashthis team! There is nothing I can think of right now. Any feedback is always welcome and taken onboard. We first used DashThis in 2013. The tools just wasn't delivering what we needed back then. We trialled again now, 5 years later and are thoroughly impressed at how far they've come. Great tool and highly recommended. Reporting on performance can be a tedious process. Dashthis makes it both easy and a pleasure. Our team takes less time on reporting and therefore more time on strategy and optimisations. Plus, our clients love the format, layout and design of the reports. "Great way to capture our digital metrics"
This is an essential tool as marketing departments become more and more accountable for their performance and how this impacts on performance. It is so easy to implement and the customer service level is unparalleled - whenever I've emailed with a problem I have had an answer almost immediately - unheard of these days in terms of digital platform support! To help the senior management team get a better grasp on how our digital platforms are performing and how this ties into our overall strategy and engagement with our audience. The fact that we can put a narrative in a text field at the top of the dashboard really helps to build a picture and make the metrics more meaningful, while those who feel more confident with delving into the detail can do so easily. The real advantage for our communications team is that we can automate these reports and email them out to senior members of the team, then use them as an opportunity for discussion in our staff meetings and think about how we may refine our strategic aims and tactical plans to get a higher level of engagement. The major overall benefit for us is having senior management understand what we're doing and how this impacts the overall work of the institution. "A practical tool for beautiful reports"
I love the beautiful reports it outputs and the fact that it integrates with most of the services we and our clients use. I wish it integrated with more services because I find myself having to do workarounds for a few of them. Still, it saves me a lot of time when pulling monthly reports. This is a great product! I read through some support articles before getting started. I thought I knew everything and ended up wasting time because I didn't realize you could clone reports. There are only 2 real weaknesses I see -- you can't display multiple Google Analytics accounts in one report (if you do, it aggregates all the data) and there are a few things they don't integrate with yet (like Vimeo and a few others). There are workaround,s though, since you can always upload your own image or spreadsheet. And I still think it's very easy to use and better than similar products I've seen! UPDATE: Great news on two fronts! First, a representative from DashThis saw this review and contacted me to help clarify my concerns. Excellent, proactive customer support! Second, he let me know that you can now have multiple Google Analytics accounts in one report. He explained to me how to do it and helped me update one of my client's existing reports. This will save me a lot of time in the future, plus it provides more streamlined reporting for my client (as opposed to the workaround I'd been using). We were spending a lot of time providing monthly reports for our clients that were simple, unflashy Word documents. DashThis reports save time while producing a better-looking report that allows clients to view their stats more easily at a glance. "The best agency reporting solution we found"
DashThis is saving us countless hours in data collection for our client reports. They provide data integrations for all of the most popular data sources (and many others) and a wide range of different ways of digging into and displaying this data. The resulting reports look great in web dashboards and can be exported into PDF reports as well. We've found the team at DashThis to be very responsive to support queries and their website contains documentation for most requirements. In terms of pricing we found them to be the only provider who offered a very polished and holistic reporting solution that we could afford. Not really a dislike, but just something to be aware of. If you're looking to put together highly customized reports then there will initially a bit of a learning curve with DashThis. This is quite normal given how powerful the product is and would be the case for any other reporting software. Most normal users won't be affected by this either as they provide both a range of default reporting templates as well a large selection of default reporting widgets for each of their data sources. Another thing we felt was lacking is that they do not currently offer an integration for Google My Business. To be fair however hardly any of their competitors do either, and none within their price range do. One can fairly easily still import Google My Business data exports into DashThis using their CSV import feature. We're hoping DashThis will at some stage offer a proper Google My Business integration but after having researched so many different reporting solutions we are also aware that there is no single affordable reporting solution on the market that covers all possible data integrations.The DashThis team also did acknowledge that they are constantly expanding their integrations based on which are being requested the most. They offer a sufficiently long trial period to test their product and do offer to extend this as well if required. If the features tick most of your boxes then I'd recommend you just give them a go and build a trial dashboard to see how well it covers your requirements in practice. That's what we did before committing to a subscription. We are using DashThis to compile monthly marketing reports for our clients. These reports indicate performance across multiple digital channels and we add in custom copy into each report to outline work that we've completed on our side. The biggest benefit thus far has been the amount of time that's being saved in terms of data collection. Additionally we've been able to provide a large selection of data insights to our clients since these are now fully automated and no longer require any of our time to collect. It's also been great that the design of their dashboards is very pretty out of the box. "Great dashboarding tool with an excellent customer service"
I can integrate most of the data I want to analyse and show to my clients. We use Dashthis for all our periodic reporting. As well as for our clients as for ourselves. And the contact with customer support is great. New ideas or current bugs are taken seriously and the solution is swiftly and adequately executed. There is always room for improvement. As a fast growing company ourselves we notice that our need for information grows every day. It isn't always that the dashboard precisely fits my needs. The team of DashThis however will always try to find a solution. At least try it. You definitely won't regret it. A uniform reporting tool for ourselves and our clients. It makes for a professional look, it gives our clients real-time insights, it fits with our vision of transparency and on the long run it saves time and money. "A Superb tool, to help articulate the complexity of WEB MARKETING Details"
It provides a very easy to use interface and then allows you to customize the display data in a wide variety of ways. And if you have an idea that you don't find immediately available - just contact their tech team, and they will accommodate your requests and questions with a smile. I had a very complex range of websites we were tracking, several of which were quite complex, and every time I had a question, the solid tech support team, was ready willing and able to help! I would like live chat to be a larger part of support but it is available often. But I do have to say every time I had a question, I got an answer very quick and always a thorough explanation. Even a VIDEO CLIP available to demonstrate the process. They are AWESOME! I have managed WEB MARKETING CAMPAIGNS for hundred of WEBSITES and an equal number of Social Media platforms. Since I have discovered DASHTHIS, I bring all my clients there. "Perfect Tool For Client Monthly Report"
The tool itself looks good and does what we need to provide our clients with their monthly reports. The support is next to amazing. The support team at DashThis has helped me on several occasions to build the right report. Cloning widgets inside a dashboard. I use the same widget multiple times in a dashboard and being able to clone a widget just to change the setting would be super efficient. Besides the great product, the support is AWESOME. DashThis employees great people! Our previous reporting software was old. It was a custom piece of software from a former developer that still needed manual work to process the reports. DashThis allowed us to provide monthly reports to our clients while decreasing the man-hours it took to perform the task. Amazing Customer Service. They've done a lot to ensure that the dashboard meet our needs. We've had minor data issues, but these were all remedied rather quickly. Great tool if you're looking to present data for static time frames. It can be use for monthly reporting, tracking during a specified time frame, etc. We're currently using the tool for monthly reporting for our customers and also for some internal reporting. In the past our team of 10 was spending about 30-40 hours a month doing in-depth end of month reporting; so about 3-4 hours a month per person. We're now down to about 10-20 hours max while providing even more detailed information. The team at DashThis has been extremely accommodating. They've worked with me on numerous calculations and changed to how our dashboard operate. All of this before we were even completely signed up. Big thank you to the DashThis team -- especially Phil and Olivier -- for all of the help and working through my requests! "A team - and a tool - you can rely on!" Tool is great but what makes it unique is the team behind the tool. Days in and days out, they have proven to be very helpful... and, for 5 or 6 years, I've been able to build almost any dashboard I needed. Not sure. On certain occasions, I need the team at DashThis to do something only them can do... so this ends up slightly slowing my work. Bad thing is that I may have to write to ask them to do a certain tweak (like building a widget that computes data from other widget). Good thing is that they do it (and that they usually do it within an hour or two). Give it a try with a few clients and see for yourself (how the software works for you and how well the team is able to answer your questions). As a Pay-Per-Click guy, I use DashThis to build advanced dashboards for clients. Together with them, I've managed to build, over time, one-screen dashboard that clients/owners like to open! "Incredible Game Changer for Our Agency"
It automates the collection of crucial information to communicate to clients. It visualizes data and has some many connection points that it's the most all-encompassing data dashboard on the market today. I think to date there might only be one tool we use that we haven't got an API for - but DashThis actually listens and they're working to add it in for us and other agencies. It's remarkable how incredibly sophisticated the product is and yet they still have time to listen and accommodate requests. Game changer for client communications and expectations. Also, helps in the sales process! Communicating the work we do for clients through SEO, Digital Ads and Social Media. It allows not only our existing clients to see what we do - but in the sales process, it proves to potential clients how we take data, conversions, goals and auditing our work seriously. "Searched for years to find something like this"
My clients are blown away by their dashboards. The data is easy enough to understand for non-technical people, and allows the flexibility to go pretty deep for the people who want more. Makes ou lives so much easier. Sometimes the links to the individual reports change, which means that our clients' links break and we have to refresh them. We measured client satisfaction before and after, and that difference alone was worth the cost. We've also set up dashboards as loss-leaders for clients which is a great way to get them in the door. And then of course the time savings is huge. Always-on reporting for our clients. It makes them feel more a part of the process, and saves us a ton of time. "Would Highly Recommend For Small to Mid Size Agencies As Well As Client Side"
I first found DashThis several years ago while I was managing a digital marketing team at an agency. We were spending ridiculous amounts of time on Monthly Reporting so there was less time available to gather insights and recommendations based on performance. We needed a solution where once setup the monthly reports were pretty much ready for us to analyze and prep for the client calls. Once the initial setup was complete, it definitely saved a lot of time. It took me awhile to figure out some of the more technical items - like how to enter Google Analytics API language into the queries to get very specific with what I wanted and didn't want from the system. Once I figured that out though, there was no stopping me. It really wasn't difficult, I just needed to make myself a cheat sheet for the things I commonly needed and I was all set. Also, I wish I had more options available for pulling in 3rd party data that is not setup via API with DashThis. They have all the major players already setup in the system, but there are always other sources that need to be pulled in. I found out the workarounds and can email in updates that will automatically update the dashboards. If this data could update automatically from a shared drive location on my network that would be awesome, but so would a magic wand. Use the free trial (no credit card needed) to see if it will work for you. Being able to tie in all marketing initiatives for a complete view of what is working and what is not. This view into performance and our core KPIs is great. Much better than complicated Excel reports that I have put together in the past. "Saves time and helps clients - the best of all worlds"
Bring up the ability to see results and data when you're pitching clients - it is a huge differentiator. Waiting for reports is one of the most common pain points I hear from clients looking to switch digital marketing providers. A huge issue in digital marketing is reporting. Tools are often expensive, incomplete, and/or difficult to set-up or learn. They almost all require ongoing effort to manage, making the first few days of the month, when all the clients want to see their reports, a gauntlet for account and client managers. As a small agency owner with a few staff members, DashThis saves me money by saving me time. And it is one of the most complete and inexpensive tools I have found. "Great Reporting Tool & Incredible Service and Support"
Ease of use. Most vendors we work with are already integrated with the platform. When we've had unique needs for additional data sources, DashThis have been very accommodating in helping out. Only thing I wish was different flexibility of date ranges. If you are looking at the MTD numbers of a monthly dashboard for a partial month (say May 1-15) the variance to last year is for the full month. So you can't really compare apples to apples until the period is fully completed. Take advantage of their individual account for 3-4 months so you really have a chance to kick the tires and get an understanding of all the features available. While there is a 15-day trial you can't really get a full feel for everything available in that short of time. DashThis has been a strong partner of Wpromote’s for several years. They have helped us to provide dashboard reporting ‘at-scale’ for several multi-location clients who required a reporting view for each of their brick and mortar locales across North America. This required customization of data segmentation and development of a few proprietary data widgets unique to the client. The DashThis team was highly responsive to our needs and were able to find creative solutions in a timely manner. "DASH Really is the Best Reporting Dashboard"
I love the price, but I also appreciate the support from DASH when I have even the most uncomplicated question. They have evolved over the past 5 years I have used them, and I will continue to use them as long as possible! There is not one thing I dislike. Every time I wish they did something, it comes out quickly. I wish they integrated Google Business for reports, but it clearly states that it is in the works! My clients love the reports. They are clear and to the point, however I can go into as much detail as I need to. There is a widget for everything! I have realized how much more the reports can do today than what I was able to do 5 years ago! Very much appreciated! "Very complete and user-friendly solution"
The options regarding CSV uploads could be more user-friendly. But the tool is great. I save many hours of manual reporting each month. I have accurate data and visual reports at my fingertips. The tool allows me to gather all information in one place. The widget are easily understandable by people outside my marketing team! "Responsive and dedicated team to provide reports for your needs"
There are many widgets and connections you can integrate into reports. You can have them set up templates for you or build reports on your own. There can be issues with reports when they are auto-created for the next reporting period. The features, support, and price are well worth looking into this reporting solution. We have supported several hundred clients and thousands of reports with DashThis for over 3 years and continue to see the platform improved. Our clients and partners appreciate the web-based reports that we can send by URL and update instantly. The best solutions they create are web-based reporting that functions well and is very flexible to provide whatever data you want to a client. Dashthis allows our agency to save time on data collection. This not only saves us time and energy, it also saves our clients time on reporting needs as well! The text editor could be improved by including spell check and a few advanced features, though it gets the job done in it's current form. The simplicity of the platform is what sets it apart from other tools. Efficiency is the name of the game in the analytics world. This is a problem that Dashthis helps to solve. We can now focus our efforts on actual data analysis and making marketing decisions instead of wasting time manually gathering data and creating visual representations of said data. "All in one tool and a great support"
Easy to use, to set. One of the best customer service received among several tools daily used! There's a learning curve to get for setting right your reports but once they are in place your job is so much easier. Plus, the support is always there to help you setting it! We have so much less manual job to do. Dashthis saves us many hours per month that can be use with ours customer! DashThis is very good reporting software. The support from the company is fantastic, and they are continuously improving the software. They take feature requests on board, and have really been great to work with. The software still isn't quite 100% yet, but it's getting closer all the time. The WYSIWYG editor for comments box leaves a bit to be desired, and the inability to format it is just a bit frustrating, it leaves a lot of white space that I'd like to minimise. But these are such little quibbles, we keep using the software. It definitely saves time when reporting! We really love DashThis. But our clients love their reports even more. DashThis looks great and offers a format that is easy to read and analyze. It's simple to integrate different platforms into DashThis and include the metrics that are most important for our clients. Our only complaint would be that sometimes it is necessary to refresh dashboards in order to get the most up to date numbers. Clients will really love the UI. We have monthly meetings with our clients and needed a simple and easy way to give them monthly reports. "Making life easier for us!" Easy to "set it" and "forget it" Customer service is top knotch. Philippe is the nicest guy ever. There is a bit of a learning curve to getting the reports set up but once they are in there it's pretty slick. We were doing more manual work before, downloading reports, data, etc. Dashthis saves me about 15 hours per month in saved time creating reports for our clients. "Awesome program, which comes with fantastic support! " Dashboards formats are great and easy to read. Would like the ability to amend templates once created as if you make a mistake at the moment you have to start again or get someone to change in the background. Also is the system could pick up the spreadsheets already in the system when creating widgets rather than having to resend them would be good. Data is better displayed and its saving us time in manually creating dashboards each month. "DashThis Helps My Team & My Clients"
Ease of use, flexibility and strong customer service. The tool could use some sorting capabilities on widgets, but customer service has always handled my requests. Just do the trial. You will find out quickly if it is right for you or not. We are providing automated reports that are done efficiently. The tool has helped us close new accounts and improved customer satisfaction. "Great support and easy to use"
Their customer support is great. Interface is straightforward and easy to use. No API functionality. You might struggle if you're getting data from a source outside of their partners. Facebook client reporting. DashThis provided us with the metrics we need as well as an easy way to automate our client reporting. 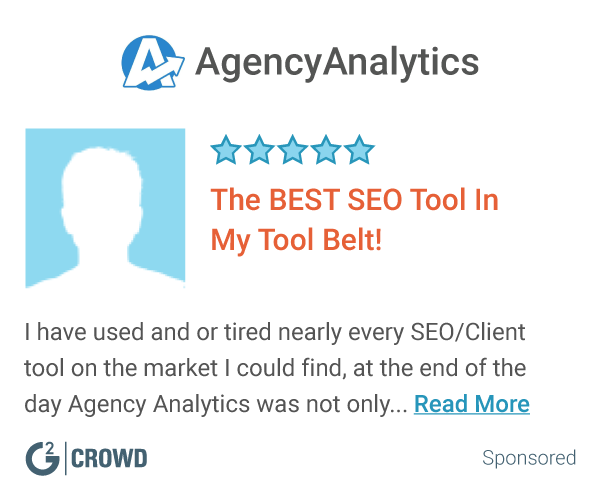 "Great agency reporting tool, awesome support!" The personal way of support is awesome. They reply incredibly fast and accurate. Pricing for whitelabelling and custom url's is a bit high, that restrains us from upgrading. Realtime reporting is a huge feature for clients. "Might be the best platform on the market today!" I love the ease or integrations, data, and setup. I'm able to train staff and clients on the data being presented with minimal frustration. At this point, nothing. Everyone on the support team has been amazing. Do it! Very user-friendly and well thought out. This tool has given us a reasonable reporting metric system to help our team deliver the result in a way that is easy for our client to digest. Interfaces with what I need it to. The team is great to work with and even when I struggle with the CSV upload, they program it for me. I wish the CSV programming was more intuitive and I look forward to the list of reporting APIs growing to include more of our tools. Spend time getting to know the reps.
Too many different reporting platforms -this consolidates what we give our clients. I have always appreciated DashThis’s strong and quick customer service. I also like that this tool allows multiple integrations at a time so you don’t need a separate report for PR, Ads, Social Media, Website, etc - it’s all in one! I dislike that you can’t change the reports colours or styling without paying a large fee around $900. DashThis allows me to report on overall performance in an easy-to-follow way. It is much more visually appealing than a spreadsheet. "Solid Reporting Program - Beautiful UI - Integrates with Major Platforms"
The UI is very clean and well organized. Providing live dashboards for our clients to view their marketing progress and performance. "Great customer experience with DashThis"
Paul was so helpful and really quick in responding to my questions. Great experience! nothing don't have anything bad to say about my experience. I love the intuitive nature of the tool. Like with most software, it can be buggy at times. Reporting for digital marketing campaigns. * We monitor all DashThis reviews to prevent fraudulent reviews and keep review quality high. We do not post reviews by company employees or direct competitors. Validated reviews require the user to submit a screenshot of the product containing their user ID, in order to verify a user is an actual user of the product. Hi there! Are you looking to implement a solution like DashThis?